Big and Tall chairs have become one of our most popular types of chairs. Many people are looking for a larger office chair to fit them properly and give them the sturdiness and the support that they need. 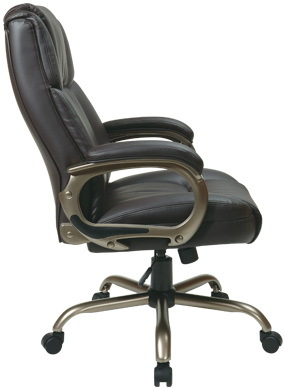 We are pleased to introduce Office Star Products Big Man’s office chairs. Office Star has come out with the most ideal big and tall chairs yet; and with a weight capacity of 350 lbs. Unlike the typical chairs designed for larger people, these chairs are designed with STYLE as well as comfort and sturdiness. The new Big Man’s line consist of three different models offering black or espresso eco leather or a breathable mesh fabric. These chairs are an excellent choice for anyone looking for a big and tall office chair that will compliment their home or office. For people who weigh close to 400 lbs, I’ve seen them lean on the arm of a couch to balance themselves in order to stand. That said, a big and tall chair without arms may be problematic? I’ve only seen these chairs with arms? What do you think? Arms or no arms?